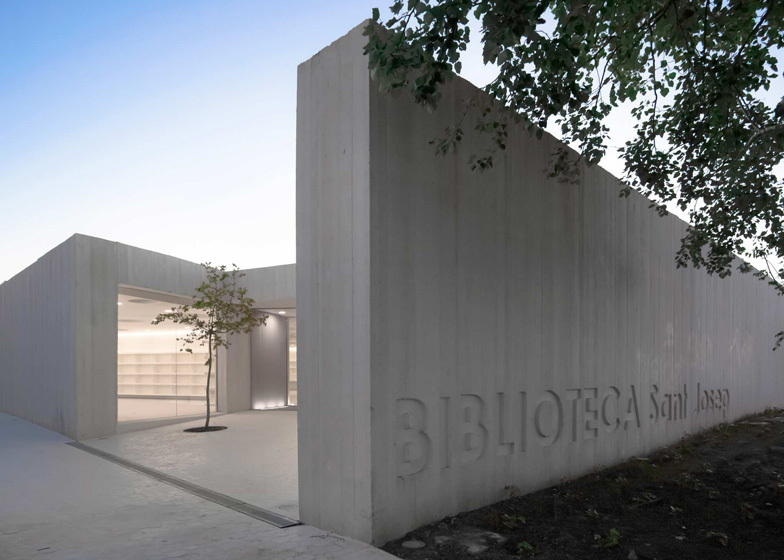 Four courtyards penetrate the rectilinear volume of this concrete library in Spain by architects Ramon Esteve Estudio (+ slideshow). 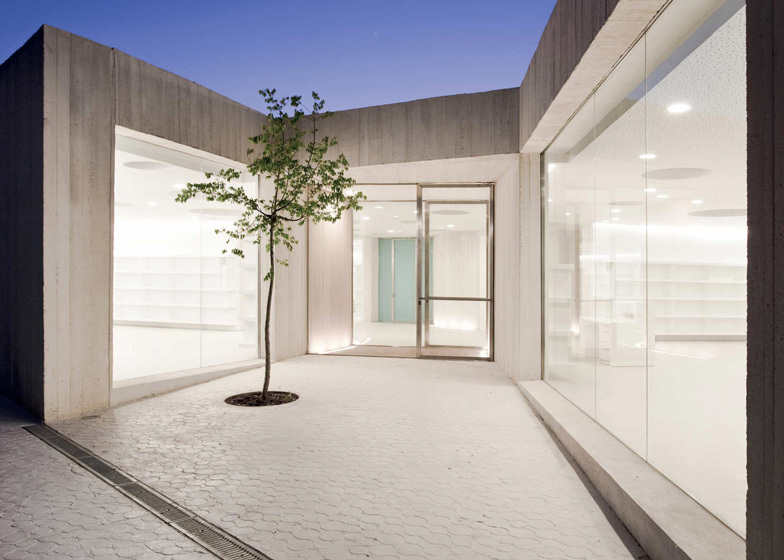 Completed in 2010, Biblioteca Sant Josep is a single-storey public library in the village of Sant Josep de sa Talaia Ontinyent, south of Valencia. 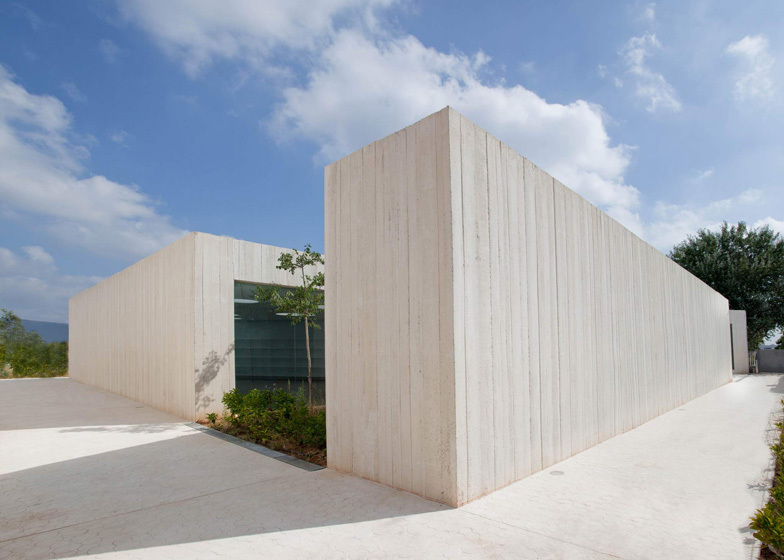 Ramon Esteve Estudio slotted courtyards into recesses on three of the building's four elevations. One accommodates the entrance approach, while the other three are filled with plants and trees. Every window faces towards a courtyard, rather than out the building's perimeter. "This library is a small closed universe in which light and green penetrates under controlled conditions," say the architects. The outlines of the courtyards continue through the inside of the building, generating the curved shapes of four reading rooms with a communal lobby at the centre. One of the curved spaces contains a children's library, while another houses the multimedia room. The third has an area for magazines and newspapers in its corner and the fourth includes the lending desks. The board-formed concrete walls remain exposed both inside and outside the building. 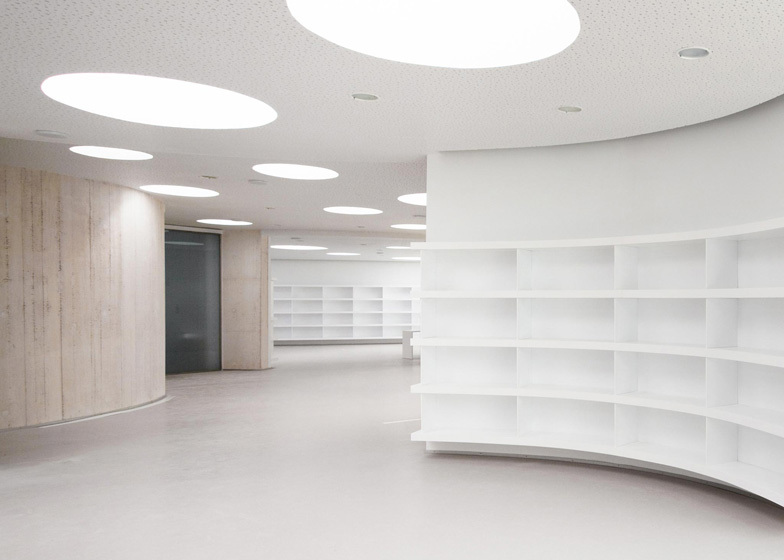 Books are slotted into plain white bookshelves, while circular lighting fixtures are dotted across the ceilings. The spaces behind the courtyards are filled with offices and storage areas. Other libraries featured on Dezeen include a converted house in Mexico and a university library with robotic book retrieval system in the US. See more libraries on Dezeen. Photography is by Diego Opazo. The library is a detached building within green surroundings splashed with trees that penetrate into the openings of the building. 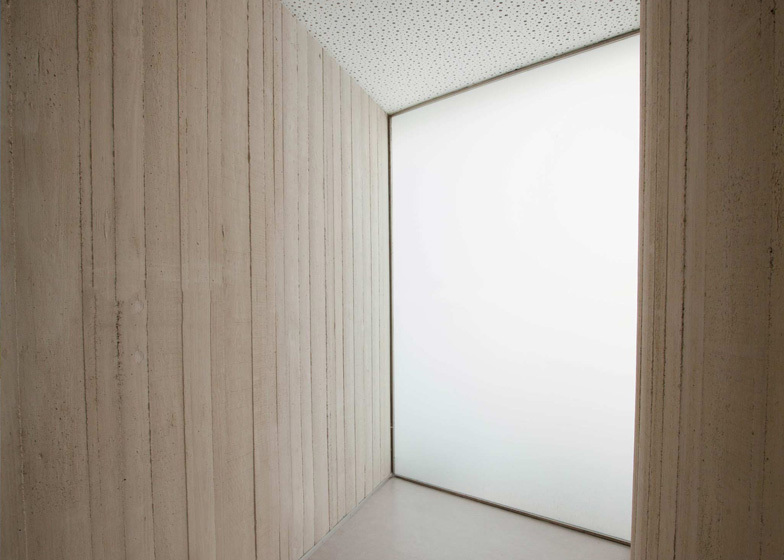 It is a prism box where the interior fragments with planes that flow between the spaces of the layout of the library. Between two fissures, the building opens to the exterior and allows the interior spaces to reach out to the vegetation that surrounds all of the building. 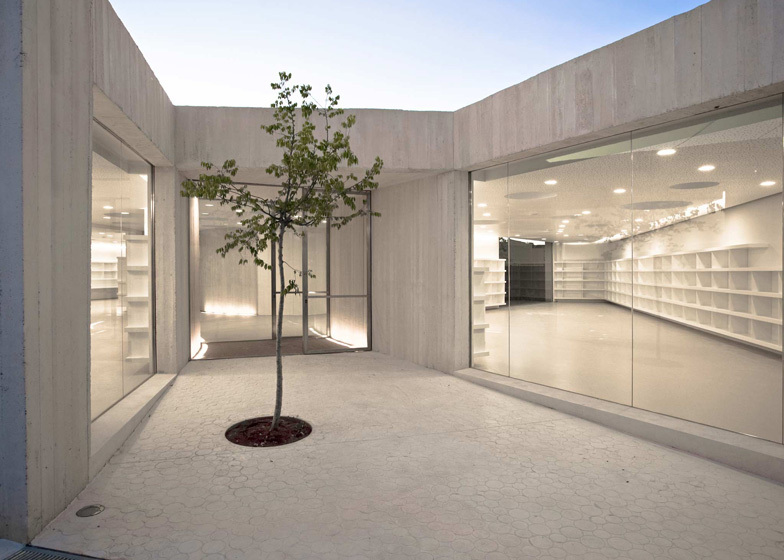 The building is composed of two different rooms, part of the functional design: the multi-purpose space, the children's one, the general background, and the space for magazines, newspapers, music and images. The soul of the library is the books that accompany the walls that form the structure that organizes the different areas. The surroundings give unity and include all of the space of the different areas, marking the limits but maintaining the continuity and fluency of the spaces. The building opens to the exterior through polygonal courtyards that generate intersecting views between rooms and fleeting views of the environment. 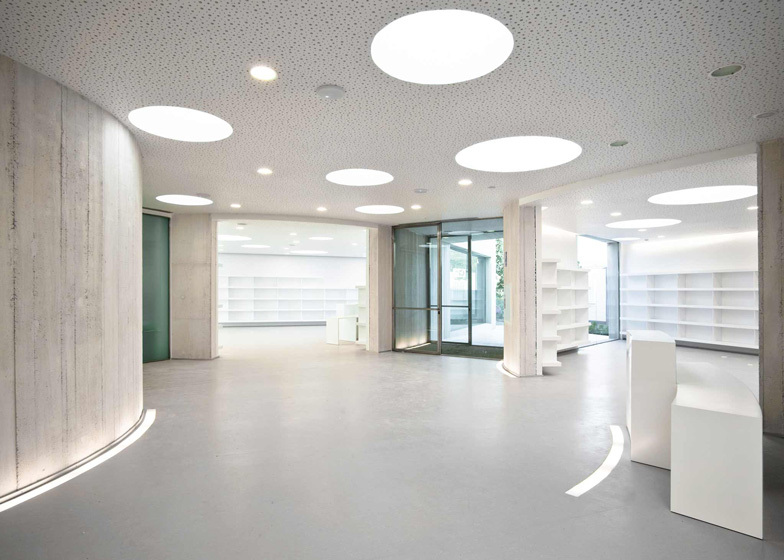 A large amount of skylights of different diameters filter a similar, neutral, clean light, generating a warm atmosphere that encourages reading and reflection.